In a stroke of marketing genius, the Padres and Wayne Partello have designated tonight Jedd Gyorko Replica Jersey Night, which CONVENIENTLY coincides with Jedd being signed to a long term contract. On a personal note, I’m going to a group event that the man himself, Jedd Gyorko, will be stopping by at before the game, so I’m pumped. I hope he shakes me hand and I never wash that hand again and it ends up giving my baby some type of illness. It’ll be totally worth it and I’ll tell her someday that I passed along Gyorkoitis to her and she’ll laugh and laugh about the good old days. With any luck, the Cashner Replica Jersey Night will also CONVENIENTLY coincide with a Cashner long term contract. We will see. For now, we are facing the hated Giants and I am [not] looking forward to a Petco Park full of SF Giants simpleton fans. 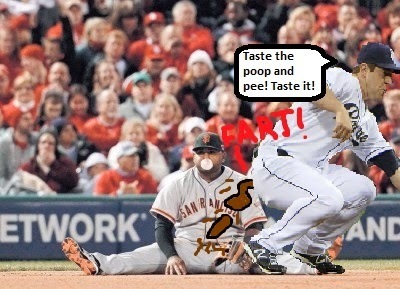 To celebrate the occasion, here’s a SCLUSIE photo of Jedd literally dropping logs on noted human garbage disposal and sperm whale impersonator, Pablo Sandoval. Knowing Pablo, he’ll mistake the logs for Snickers bars and exclaim “YUMMY NUMMY IN MY TUMMY!”. What a rube.